French jewelry house Van Cleef & Arpels is showcasing an exhibition called “Masterpieces from Van Cleef & Arpels Collection” at the famed and elite Petrovsky Passage department store in Moscow, reports Rough & Polished. The exhibition, held to mark the opening of Van Cleef & Arpels’ new boutique in the Russian capital, gives visitors the chance “to learn more about the heritage and the development of styles throughout the 20th century” and showcases more than 60 pieces dating from the 1910s to the 1980s. 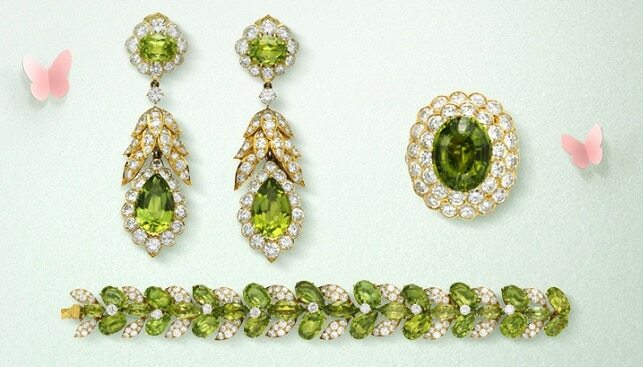 Some highlights include a 1939 platinum and diamond necklace, once a part of the collection of Queen Nazli of Egypt; a set of a diamond bracelet and diamond earrings set in yellow gold from the Peridot set, made in 1967; and a cords bracelet made in 1949, featuring platinum, yellow gold and diamonds.